While True Story Theater draws from various forms of applied theatre and performance arts, we are especially indebted to Playback Theatre. Playback Theatre was founded in 1975 by Jonathan Fox and Jo Salas in New Paltz, NY. 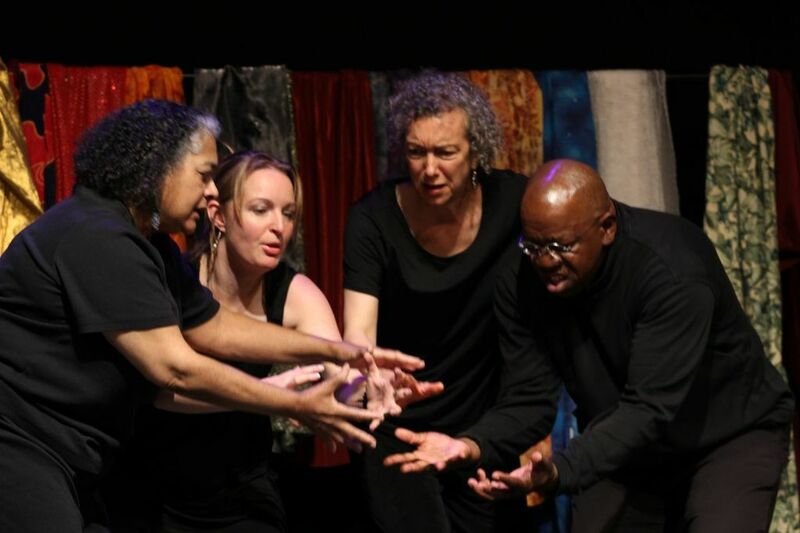 Their initial troupe developed Playback Theatre over years of experimentation, influenced by psychodrama (a form of drama therapy) and traditional forms of oral storytelling. Although Playback Theatre often has therapeutic affect, its focus is on building community rather than healing individuals, and on empathy combined with artistry. Southern India: Groups of Dalit people have used Playback Theatre to assert their rights. Western Australia: Playback has helped landowners and Aboriginal people find common ground. Burundi: Hutu and Tutsi actors work together in a Playback troupe in a country healing civil war. Germany: Jews and Gentiles speak of their lives in contemporary Germany. USA: After the 9/11 attacks, Playback troupes have invited Muslims to share their experiences. See the International Playback Theatre Network for more information, including details about the July 2015 International Playback Conference to be held in Montreal, Canada. In 2010, members of True Story Theater were instrumental in organizing Playback North America, a network of about 50 Playback companies plus Playback fans from across the US and Canada, plus some international friends. The network has organized two Playback Festivals, and now hosts monthly teleconferences where Playback Theatre practitioners from across the network can learn from each other. Membership is open to all interested. See a 99-second video featuring Playback Theatre voices from across the network. Playback Theatre is a life-giving practice, whether you’re an experienced performer or have never tried anything like it. Try it yourself! Come to an International Playback Theatre Network conference. Learn about the Centre for Playback Theatre. Read about Playback Theatre in books obtained through Tusitala Publishers.